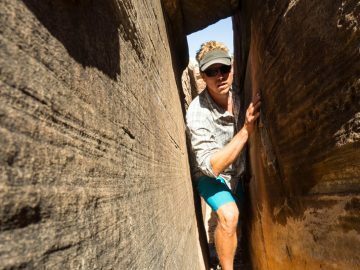 Approaching his 13th season with OARS, Lars has been a cornerstone of our Canyonlands operation. He’s seen his share of big whitewater, paints a pretty fancy toenail and delivers the best star talk you’ll likely ever hear on a river trip. 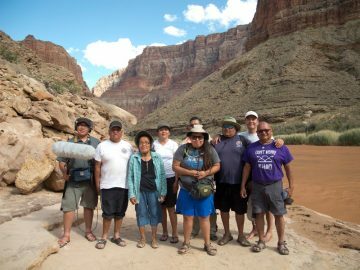 In 2011, we had a record breaking year for high water in Cataract Canyon. What stories come to mind when you reflect on that experience? I stayed here in Moab, waiting to see that high water, and I finally got my chance. So there I was, in this oversized tin can, floating downstream with a family of four. We gave them every chance to get out of the boats and into the motorboats, but they said, “Nope, we’re with you guys all the way,” so I said, “Alright, here we go,” and untied our bowlines above Big Drop 1. We made it through Big Drop 1 and entered into Big Drop 2. I was the lead boat, and all of a sudden I found myself on a roller coaster of emotions. The first emotion was, “Oh my gosh, we’re really doing this, we’re really going to pump through this rapid at this amazing high flow. No one else is out here rowing this, it’s just us.” Then the roller coaster plunged off the backside and I had this horrible sinking feeling as I realized I was not making my move. And to make the move in Big Drop 2, you really have to be on the far, far right side of the river, almost brushing against the shore. The dory didn’t make it. We were headed into a little feature we call Little Niagara, and as I dropped into that I gave it one hard push, and the dory just stood up and we looked at the sky and I thought to myself, “Wow, this roller coaster’s coming out, I’m going to make it over the backside!” and there came that sinking feeling again as we drifted back down into the pit. Then the dory flipped, we all swam, but all’s well that ends well. We were all smiling afterwards, eating lunch. 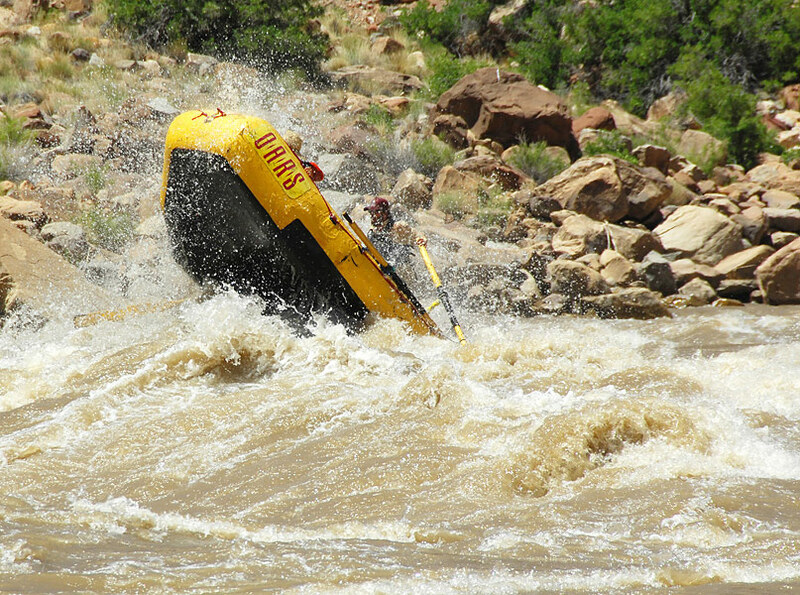 What runs through your head when dropping into Big Drop 2 and 3 at 90,000 CFS? Do you do anything special to prepare? So when you’re down there running big water like that, before you push off from shore there’s a lot of stuff going through your mind. But once you tie up your bowline, coil it up, stow it away, my favorite technique is just to empty my head. Empty my head and let my body and brain take over because they know what to do. If I let my emotions get in there, that’s just going to get the best of me and stand in the way of me running a perfectly good line. So what I like to do is just focus, focus, focus on my run. Sometimes I close my eyes, take a deep breath, and visualize the rapid from top to bottom. Visualize every feature in that rapid, and what I need to do as a boatman to get my boat through those features and into the eddy down below. 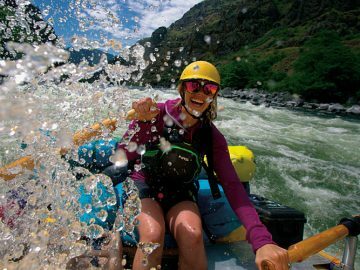 Do you feel more comfortable rowing a raft or a dory in big whitewater? Why? One of the things I like most about rowing a dory in any whitewater, but especially big water, is the fact they can just slice through the biggest wave. A wave that would take a rubber raft and smash it, crush it, knock it sideways and dump its occupants into the river. A dory will take that in stride, it was built for that. They were designed to slice through these waves, in the ocean, to go out and fish. We’ve taken that design to the next level now with these decked compartments and beautiful wood working; I think the dory is the ultimate craft for big water. If I had my choice, I’m gonna be in a dory every single time. Lauren is a director and producer at Backstay Media. She previously worked as OARS’ Sales & Marketing Coordinator.